Criminal Investigation Department (CID) identified five more victims of Chawkbazar fire through DNA test on Tuesday. The victims are—Ismail Hossain, 60, Zafar Ahmed, 43, Foysal Sarowar, 53, Mostafa Mia, 39 and RehnumaTabassum Dola, 19, reports UNB. 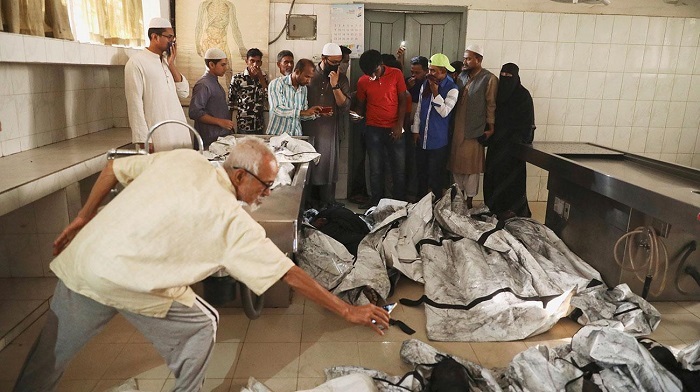 Additional Inspector General of Police Sheikh Himayet Hossain said the CID disclosed the identities of the deceased at a press briefing at its conference room in city’s Malibagh area. However, the identities of two victims of Chawkbazar fire incident could not be known yet as no DNA samples matched with the victims’ sample, he said. On March 6, eleven more victims of Chawkbazar fire were identified through DNA tests. A deadly fire broke out at a chemical warehouse in Chawkbazar on February 20. So far, 71 people have died.